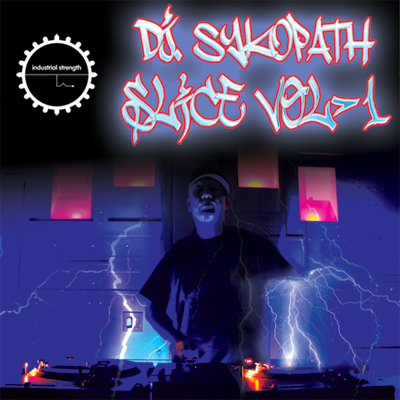 Industrial Strength is getting down to business with DJ Sykopath's Slice Vol 1. With 430 samples, this amazing scratch pack contains a great source of original material for any producer or Dj looking for usable scratches and original vocal samples for djing and production work. Turntable wiz Dj Sykopath is a underground legend in New York's early rave days, rocking the tightest scratches over banging electronic music before anyone in New York City. His unique scratching style has appeared in multiple formats and include songs featuring band members of Public Enemy and Biohazard. His scratch work also surfaced on Industrial Strength Records BHK Fidget Sample Pack. His Additional solo productions can be found on 12" vinyl on Rob Gee's A.D.A.M. Worldwide. He has further gone on to start a DJ scratch school and he runs Outer Limits studio in New Jersey where he constantly records vocal sessions. Knowing this would be a lethal combo we asked if he could gather up his crew and combine his studio skillz with his fierce style of scratching. The result. Slice Volume 1. All the vocals recored in this 24 Bit pack are original and license free. Some of the vocal phrase's might contain foul lingo keeping in the true spirt of the underground. We even Included all 99 vocal one shots in 16 Bit Audio so you can burn them on on any audio Cdr and start rocking your own scratches in no time flat. You can use them live at a gig or use any music production you wish. On the studio side of things, Dj Sykopath's first collection contains over 300 scratch loops that range from 87 Bpm to 130 Bpm. Slice Vol.1 is available as Acid Wav, Aiif, Apple loops and of course Rex.2 for total control of each loop. Slice Volume 1 also features rewinds, back spins and a few turntable effects all set up in NI's Maschine, Battery 3 and Kontakt to make Dj Sykopath's first collection a well rounded studio tool. As added bonus we included 10 bonus drums loops from Vintage Breaks Volume 1 and the demo drum loop for good measure. We had loads of fun making Slice Volume 1 we know you will have fun using it. CLICK HERE for info on pack contents and producer.